St Luke's Church in Christchurch was registered as a Category II historic place with the New Zealand Historic Places Trust. Built on one of the five sites set aside in the central city in the original survey of Christchurch for the Anglican church, it was demolished in July 2011 following damage sustained in the February 2011 Christchurch earthquake. The site bounded by Manchester, Lichfield and Peterborough Streets was one of five sites set aside by the Canterbury Association in the original survey of Christchurch, which was carried out during 1850. A church, the Chapel of Ease, was built on the site between 1858 and 1860. After St Michael and All Angels, it was the second Anglican church in Christchurch. The result was described as "ugly and barn-like". This first church had a frontage onto Peterborough Street, and it was extended in 1871 based on a design by Benjamin Mountfort. The Chapel of Ease was demolished in 1908. St Luke's was designed by Cyril Mountfort, the son of Benjamin Mountfort, in Gothic revival style. St Luke's design is similar to two churches designed by Mountfort Senior in the 1880s; The Church of the Good Shepherd in Phillipstown (demolished in 2011) and St John's Cathedral in Napier (destroyed in the 1931 Hawke's Bay earthquake). 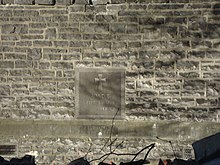 The foundation stone was laid by Bishop Julius on 3 September 1908. Construction took 13 months and the contract value was ₤9,800. The church was consecrated on 17 October 1909 by Bishop Julius, and the sermon read by Archdeacon Averill. Of the series of eight stamps issued by New Zealand Post for Christmas 1995, the four highest denominations ($0.80 to $1.80) depicted scenes from the stained glass windows of St Luke's. 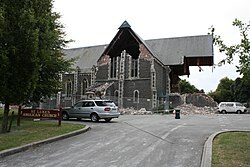 The church was badly damaged in the February 2011 Christchurch earthquake, deconsecrated, and demolished the following July. The church can be seen in Gerard Symth's video chronicle of the earthquakes, When A City Falls. The congregation is still meeting, despite the earthquake damage, and counselling services continue. Services are currently held in the Mary Potter Community Centre, and at the central-city Knox presbyterian church, as well as weekday morning prayer on the St Luke's site but the rebuilding of a church on the site is uncertain. The church was registered by the New Zealand Historic Places Trust as a Category II heritage building with registration number 3353. The adjacent St Luke's Vicarage was registered on 15 February 1990 as a Category I heritage building with registration number 3132 and remains standing, under restoration as a residential dwelling. Chalklen, Mollie; Church of S. Luke the Evangelist (1985). The Church to the North of the River Avon : S. Luke the Evangelist: 125 Years of Praise and Thanksgiving. Christchurch: Vestry of the Church of S. Luke the Evangelist. ISBN 9780908675517. Wikimedia Commons has media related to St Lukes Church, Christchurch. ^ a b c d e "History of St Luke's in the City". St Luke's in the City. Archived from the original on 27 September 2011. Retrieved 7 June 2012. ^ a b "St Luke's Vicarage". Register of Historic Places. Heritage New Zealand. Retrieved 7 June 2012. ^ a b "Lost heritage 2010-11". New Zealand Historic Places Trust. Retrieved 6 June 2012. ^ "Church and Vicarage". CERA. 30 August 2011. Retrieved 7 June 2012. ^ "Church of the Good Shepherd 18". Wikimedia Commons. 9 June 2012. Retrieved 9 June 2012. ^ "Church of the Good Shepherd" (PDF). The architectural heritage of Christchurch. Christchurch City Council Town Planning Division. Retrieved 13 March 2011. ^ a b "St Luke's is being demolished". The Press. 6 July 2011. Retrieved 6 June 2012. ^ "St Luke's Church". The Star (9675). 18 October 1909. p. 1. Retrieved 7 June 2012. ^ "Christmas". New Zealand Post. Retrieved 7 June 2012. ^ "When a City Falls (2011)". IMDb.com. Retrieved 2015-06-21. ^ "St Luke's in the City, Anglican Church, Christchurch". Stlukesinthecity.org.nz. Retrieved 2015-06-21. This page was last edited on 22 April 2019, at 14:34 (UTC).